When Pietro Armienti was waiting for his wife outside a church one morning — feeling grumpy — he made a remarkable discovery. On the wall of of the church was an intricate design of circles and squares that appeared to feature the famous Fibonacci sequence. It seemed to exploit the mathematical properties of this sequence and also point towards its link to the golden ratio. Armienti decided to investigate further and has recently published his results in the Journal of Cultural Heritage. 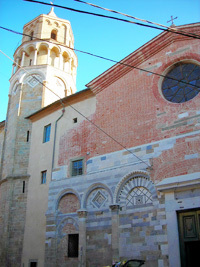 The church of San Nicola. The design in question is to the left of the door. Image: Igorkon. Armienti is a professor of petrology at the University of Pisa, the birth place of the mathematician Fibonacci who lived and worked around the turn of the 12th century. The design adorns the church of San Nicola and has only recently been restored, revealing itself to the public for the first time in centuries. Historians are unsure about when exactly the church was built, but suggest it was either within Fibonacci's life time, or forty years after his death, a time when students of his might still have been around. It's tempting, then, to assume that the design was made at the same time as the church, and that it was directly influenced, or very nearly so, by Fibonacci. but the sequence can be continued indefinitely, all the way towards infinity. 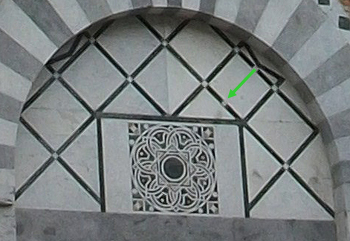 The first nine numbers of the sequence can be found in the circles that feature in the design on the wall of San Nicola. Taking the radius of the smallest circles as the basic unit and calling it 1, you can find circles of radius 2, 3, 5, 8, 13, 21, 34 and 55. 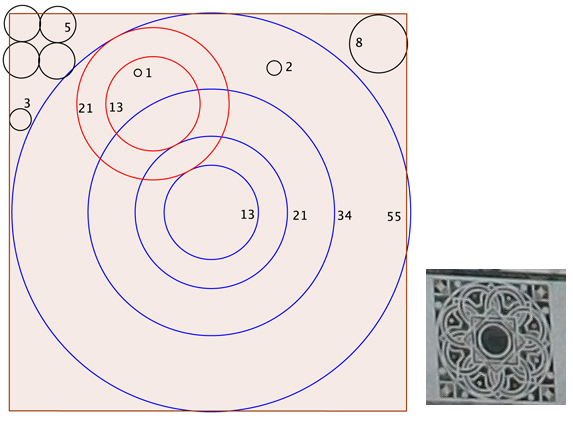 The figure shows the location of various circles featured in the square design, as well as their radii. The design itself is shown on the right (image: joanbanjo). Their arrangement exploits the fact that each term in the Fibonacci sequence is the sum of the two previous ones. For example, the four circles marked in blue that are all centred on the central point of the design, have radii 13, 21, 34 and 55 — four successive terms in the Fibonacci sequence. The circle of radius 34 (the second largest) also contains the centres of a "girdle" of overlapping rings. Each ring is bounded by two circles (marked in red), also of radii 13 and 21. Since, as we know from the definition of the sequence, 34 - 13 = 21, the smaller red circle is tangent to the second smallest blue circle, which has radius 21. For the same reason, because 34 - 21 = 13, the larger red circle is tangent to the smallest blue circle, which has radius 13. Adding the radius of the smallest blue circle and the diameter of the larger red circle we get 13 + 2 x 21 = 13 + 21 + 21 = 34 + 21 = 55. Which is why the larger red circle is also tangent to the largest blue circle, which has radius 55. Thus, the outer boundaries of the girdle rings fit neatly between the smallest and the largest of the blue concentric circles. The golden ratio was already known to the ancient Greeks (although they couldn't put a precise value on it), but not because they studied Fibonacci's sequence. Instead, they defined to be the ratio you need to divide a line segment into two pieces, so that the whole is to the larger piece as the larger piece is to the smaller one (see here to find out more). The square design of San Nicola is enclosed in a rectangle whose sides give you a ratio of — it's a so-called golden rectangle. That's very fitting, given the relationship between and the Fibonacci sequence — but it's also surprising. Historians believe that Fibonacci wasn't himself aware of the link between and his sequence, and that it was first discovered centuries later by the German mathematician and astronomer Johannes Kepler. So either the design on San Nicola doesn't stem from Fibonacci's time, or the history books are wrong and Fibonacci, or his immediate successors, did know about this beautiful connection after all. The direction indicated by one of the squashed Ms. Image: joanbanjo. The most surprising conjecture made by Armienti, however, is that the design contains a hidden recipe for constructing sequences of (approximately) regular polyhedra — that is, regular pentagons, hexagons, heptagons and so on — inscribed in a circle of a given radius. The clue towards this lies in the weird shapes that look like squashed Ms and appear in the semi-circle which encloses the design. These, so Armienti believes, indicate the initial directions that kick off the sequence of instructions. Much has been written about the appearance of the golden ratio, as well as hidden messages, in ancient or historic architecture. We’ll leave the experts to decide the significance of Armienti’s discoveries. In the mean time, we leave you with what is probably the most important insight Armienti gained through his wife’s tardiness: "It is always worth waiting for the preparations of a beautiful woman. One may be rewarded with a hidden treasure."